The City announced funding for “Equitable Community” next to the future Roosevelt Light Rail station. The Seattle Office of Housing today announced $15 million in funding for building affordable homes at Seattle’s future Roosevelt light rail station. Sound Transit and the City of Seattle Office of Housing (OH) jointly request proposals from qualified entities (local government, housing authority, or a non-profit developer) that will result in the construction of an equitable transit-oriented development (TOD) project. Eighty percent of the units must be affordable to those earning 80 percent of area median income; but lower AMI thresholds are encouraged. The request for proposals was issued Aug. 4. Proposals are due by Thursday, Sept. 14. A pre- proposal meeting will be held, but the date has not been determined. A successful proposer will be announced by the end of the year after a competitive process managed by Sound Transit and the city’s Office of Housing. The Roosevelt Station will open for service in 2021 as one of three stations that will serve the Northgate Link Extension. 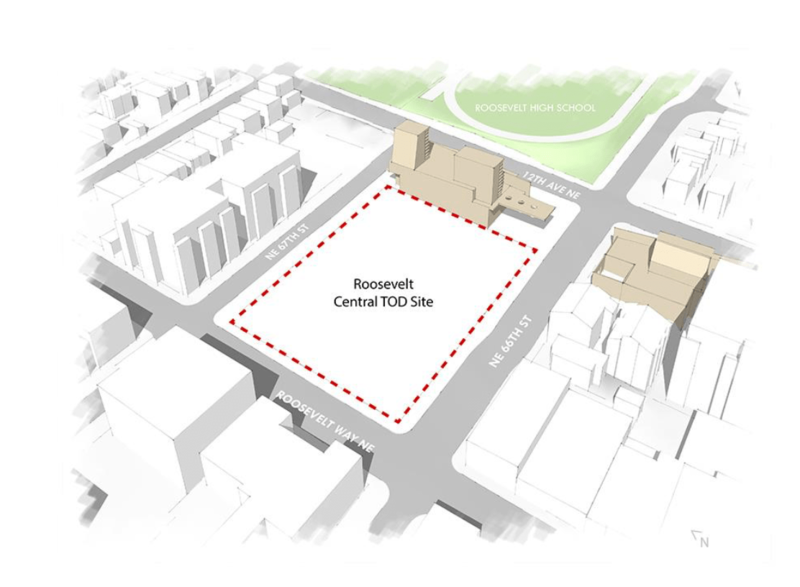 The affordable housing will be built on a site adjacent to the Roosevelt Station between NE 66th and NE 67th streets and between 12th Avenue NE and Roosevelt Way NE. The property is expected to become available for TOD construction in early 2020. Roosevelt Paint Party – A Huge Thanks! June 29, 2017 by Roosevelt Seattle Comments Off on Roosevelt Paint Party – A Huge Thanks! A huge thanks to the dozens of setup volunteers and 130 paint volunteers that came out on Saturday to paint the street! It was a hot day, the paint dried fast, and we were able to get all 3 coats laid down before the bands were through. The day kicked off with a free pancake breakfast sponsored by Calvary Christian Assembly and a few words from Council Member Rob Johnson about how the Weedin Place Project is making the area safer, just like the NE 65th Street VisionZero project intends. Brian Vogan and Good Buddy Danika played for the kids followed by The armonica Pocket. It was fun to see the kids(and kid’s at heart) enjoying the music and getting creative in the art tent with paint and chalk. In the afternoon, Warren Dunes and Nyamuziwa played to overheated and overworked volunteers. The bands were very much enjoyed! The volunteers were invited to cool off at local bars Triple R Tavern and Latona Pub for discounted beers. Other businesses participating in discounts were Evolve Hair and Art, The Weaving Works, Derby Salon, and Bus Stop Espresso. What’s next for Weedin Place? Now that the street is painted, the first phase will be finished with the placement of several small boulders (think sized to sit on) along the blue meltwater path. There will also be planter boxes on each end of the closed section of street (adjacent to the carwash). This will finish this phase of the project. The neighborhood association urges interested in the future of the neighborhood to join the RNA and volunteer as a Director or Committee Chair. The RNA encourages representation as diverse as our neighborhood. Apartment dwellers, other renters, homeowners, business owners, non-profit business and agency leaders, and employees working in the neighborhood are all welcome to be members and in leadership! Contact rna@rooseveltseattle.org or president@rooseveltseattle.org for more information. A big thank you to everyone who played a part over the past 4 years in closing Weedin Place and imagining what it could be. We are finally implementing the first phase of the “Roosevelt Glacier” theme!!! Yay!! Come out this Saturday to help paint the street and listen to live music. Fun bands and activities for the kids in the morning! Free Pancake breakfast at 9am. Family friendly bands in the afternoon – A must-see!! If you’d like to help paint, setup at 8am or teardown at 4pm, let me know!!! All setup/teardown volunteers and painters get entered into a raffle for prizes from local businesses! Bring your paint clothes, rollers and wide brushes! Phase 1 will be completed after the street painting. SDOT will place boulders along the painted blue “meltwater” river and add planters on the north and south ends of the closed section of the street. Future phases will be implemented when funding is raised. The Northeast District Council invites you to meet candidates running for Seattle Mayor at 7 pm Thursday, June 8, 2017 at Wedgwood Presbyterian Church located at the corner of 35th Avenue NE and NE 80th. 7-8 pm Candidates introduce themselves and address the question of how they will serve Seattle’s diversity of citizens: age group; neighborhood; income; ethnic background, etc. The approved resolution supports affordable housing at the Roosevelt Station TOD site. This bases the valuation for the property, to maximize affordable housing creation by reducing acquisition costs, for development to those not earning more than 60% of area median income (AMI) and establish a base price in the offering commensurate to achieving that outcome. PROPOSED ACTION (1) Declares that the Roosevelt Station – Central Transit-Oriented Development Site property is suitable for development as housing; (2) directs staff to offer the property first to qualified entities to support affordable housing creation pursuant to RCW 81.112.350; and (3) directs staff to offer the property through a process that prioritizes development of the maximum number of units affordable to those earning no greater than 60 percent of area median income and establish a base price in the offering commensurate to achieving that outcome. Thanks to City Councilmember Rob Johnson (and ST Board member) for his strong support & leadership on this issue; to Mayor Murray; and also Mayor Marchione of Redmond WA for his succinct synopsis of the 3 options that the Sound Transit Board had in regard to this vote, and his persuasive direction. The kid-friendly paint party, music celebration, and free pancake breakfast that was scheduled for May 13th has been postponed due to inclement weather delaying SDOT’s implementation of the thermoplastic on the street. The event has been rescheduled for Saturday, June 24th. We continue to pre-register neighbors for the event. We encourage all of our neighbors and anyone interested to pick up a brush and paint a section of the street – even if it’s only for 10 minutes. All volunteers will be entered into a raffle for a chance to win prizes from local businesses. Now: Assist with organizing event, seeking sponsorship of cash, products for raffle, or paint supplies. June 24: Volunteer to setup and cleanup tables, chairs, cones, caution tape, etc. Please contact weedinplace@rooseveltseattle.org to volunteer in any capacity, but also if you would like to sign up to be a painting volunteer and secure a spot to paint. If you frequent Ravenna and Cowen parks, you have probably noticed an influx of unauthorized encampments, associated garbage, and even needles over the last couple of years. The parks department does a good job keeping all the main paths and play areas clean, but they don’t get to many of the off-path areas. Abandoned encampments and just general trash can linger for months. A group of neighbors and park goers are forming a Ravenna/Cowen Cleanup Crew to do regular cleanups in the park. We’ve done two cleanups already this year and collectively have gathered about 80 bags of garbage and disposed of 37 needles. We plan to host cleanups every 4-6 weeks and our next one will happen on Saturday, May 6th at 10am. If you’d like to participate in the next cleanup or just follow along, visit: www.ravennacowencc.org. Follow the link there to join our Facebook group and get details on upcoming cleanups or discuss problem areas in the park. Come and learn about what’s happening in your neighborhood and how you can help shape it for the better! Did you know that the Seattle Dept of Transportation (SDOT) is responsible for maintaining 40,000 of Seattle’s 250,000 trees? As part of the new Levy to Move Seattle, they’ve created a new Street Tree Management Plan (STMP). The STMP aims to improve the condition of SDOT maintained street trees by the end of 2024 in a more comprehensive way. Through effective inventorying, maintenance, replacement, and community involvement we hope to ensure the health, preservation, and expansion of Seattle’s urban forest. Moving into the second year of the program, we would like to engage with communities and do our part in creating and maintaining clean, healthy, resilient, and safe environments. We’d appreciate it if you could forward our 10-minutesurvey to any relevant listservs or member groups you may have. The survey provides an opportunity to share any thoughts on where and how SDOT should focus street tree work through 2024. In addition, we have recently launched an informational website to provide anyone who is interested with more information about our activities. Together we will continue to keep Seattle’s trees growing and thriving! To specially note: In 2017, SMTP will be focusing on University District / Ravenna / Eastlake. This survey asks for public input about how the plan should prioritize work and provide information to citizens.